Covering devices from all of the leading vendors that include servers, storage, routers, switches, desktops and laptops Kaztech Solutions have the technical expertise to successfully respond to a variety of networking scenarios. Kaztech Solutions service levels are split into 3 defined areas; Fix, Response and Advanced Replacement. 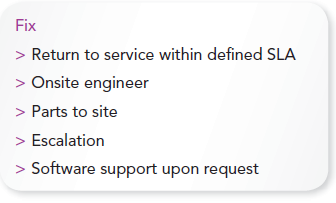 Depending on the requirement, all Kaztech Solutions clients can select a variety of options to tailor their own SLA in response to their hardware needs. 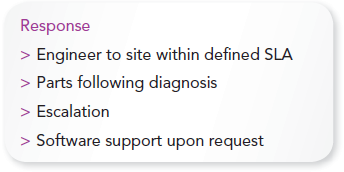 As part of the defined Service Levels provided, all Kaztech Solutions clients can select a specific time constraint to accompany the SLA whether that be a 4 or 8 hour response, Monday to Friday coverage, or a complete 24/7 support package. These flexible options mean Kaztech Solutions can deliver measured service levels to its customers in a way that exactly meets their specific needs. Please contact us today for a free no obligation quote around our Hardware Maintenance contacts.